GnuAE is looking for a co-maintainer. If you're interested, please take a look at this general information about GNU packages and being a GNU maintainer, and then email maintainers@gnu.org with a bit about your background and particular interest in this package. Thanks. GnuAE currently only runs on GNU/Linux & MacOSX, although some attention has been paid to eventual ports to M$ WinDoze (using cygwin). This is the initial alpha release, so your mileage may vary... I can think of a few bugs right now I need to fix before the first release. Sorry for the lame GUI, I'm not a GUI programmer, I'm more of a system hacker. Please contribute to the development of this project by helping track down bugs, or add features, or improve the GUI. GnuAE releases (when the release is done) will be found on in the subdirectory /gnu/gnuae/ on your favorite GNU mirror. I use DIA for drawing wiring diagrams. Here's an additional sheet and shapes for alternate energy systems with things like inverters, photovoltaic panels, batteries, etc. 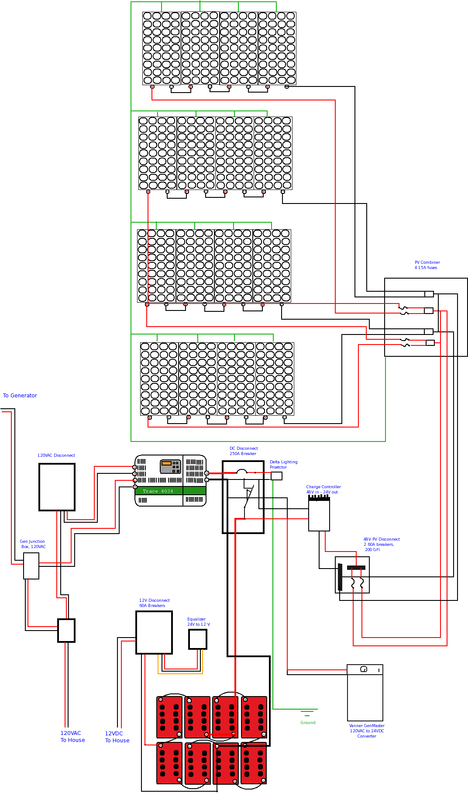 As an example, here's a wiring example based on my own system. For more detailed information on CVS usage at gnu.org, read CVS Usage at gnu.org. You can also browse the sources. gnuae@gnu.org is for discussion of gnuae development, porting to new platforms, ideas for the future, general gnuae usage or problems. New alpha and stable releases are announced here. To subscribe, go the http://mail.gnu.org/mailman/listinfo/gnuae Volume is typically low. bug-gnuae@gnu.org is a special list for reporting bugs, and to enable the developers to track submitted bug reports. If you think you have found a bug in gnuae, then you should, in the first instance send as complete a report as possible to this list. ideally, you should include the text you get by running config.guess, the text you see when you run configure,	and if you can, a patch made with diff -u5 which fixes the problem. It will also be useful to send the logfile from the test run. To subscribe, go the http://mail.gnu.org/mailman/listinfo/bug-gnuae Volume is typically low. gnuae-commit@gnu.org is where summaries of changes commited to the CVS repository are automatically posted. If you wish to see these changes as they happen, http://mail.gnu.org/mailman/listinfo/gnuae-commit Volume is sporadic, but typically low. gnuae-patches@gnu.org is where the patches to the gnuae repository are posted for peer review before being commited to CVS. Send an email to gnuae-patches-request@gnu.org with subscribe as the subject line if you want to join. Volume is typically low, though individual messages can be quite large. Announcements about GnuAE and most other GNU Software are made on <info-gnu@gnu.org>. Please remember that development of GnuAE is a volunteer effort, and you can also contribute to its development. For information about contributing to the GNU Project, please read How to help GNU. If you think you have found a bug in GnuAE, then you should send as complete a report as possible to <bug-gnuae@gnu.org>.